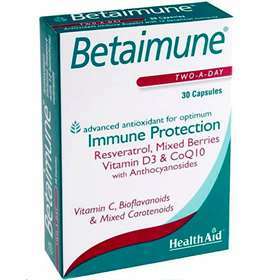 Betaimune Two-A-Day Capsules contain a combination of well-known powerful Antioxidants, Bilberry Extract, Pine Bark Extract, Beta Carotene, CoQ10 & Bioflavonoids, together with carefully selected vitamins and minerals, for optimum immune support. Antioxidants play a key role in protecting the body against circulating free radicals, which cause damage to the cells and tissues. Advanced antioxidant for optimum immune protection. Vitamin D3 & CoQ10 with Anthocyanosides. Vitamin C, Bioflavonoids & Beta Carotene. Free from yeast, gluten, wheat, dairy, sugar or salt. Free form artificial colours, preservatives & flavourings. Adults and children over 12 years of age, two capsules daily with food. Capsule Shell Agent (Gelatine), Humectant (Glycerol, Purified Water), Natural Colour (Black Iron Oxide), Bulking Agent (Soybean Oil), Vitamin C (Asocorbic Acid), Sodium Selenite, Natural Vitamin E (D-Alpha Tocopherol), Pine Bark Extract, Citrus Aurantium Extract (Providing Citrus Bioflavonoids), Red Grape Extract, Copper Sulphate, Vitamin A Palminate, Vitamin D3 (Cholecalciferol).